Those of you who follow me on Instagram saw that I recently spent some time weeding through my collection of recipes that I pulled out of magazines in an attempt to Control. The. Chaos. 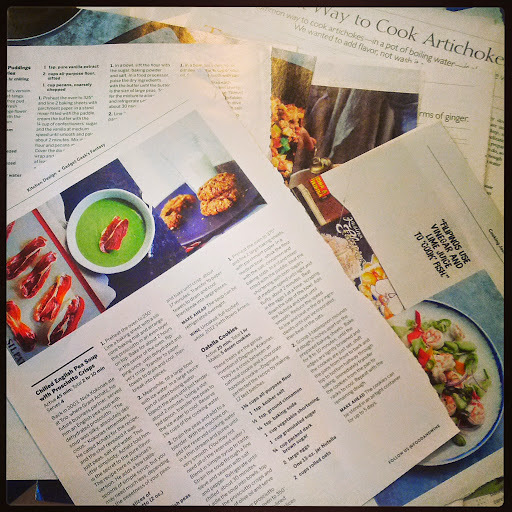 Although it was a little overwhelming, I had fun going through the stack of recipes, trying to remember exactly why I was inspired to tear the page out of the magazine. When all was said and done, I threw more than half of the pages into our recycling bin, only keeping the recipes that I was serious about trying some day. This week's Menu Plan includes a handful of recipes from the "keeper" pile, and I can't wait to test them out! Are you ready to see what's on deck for dinner for us this week? This was actually on last week's Menu Plan. I was going to make it for dinner yesterday, but Stephen and I decided to schedule a Date Night instead. Since I had already gone out to buy the shrimp, I decided to push it to tonight. Ah, the beauty of menu planning... Even though you've structured a plan, it actually allows you some flexibility when you need it. What's on your Menu Plan this week? Let me know in the comments below!